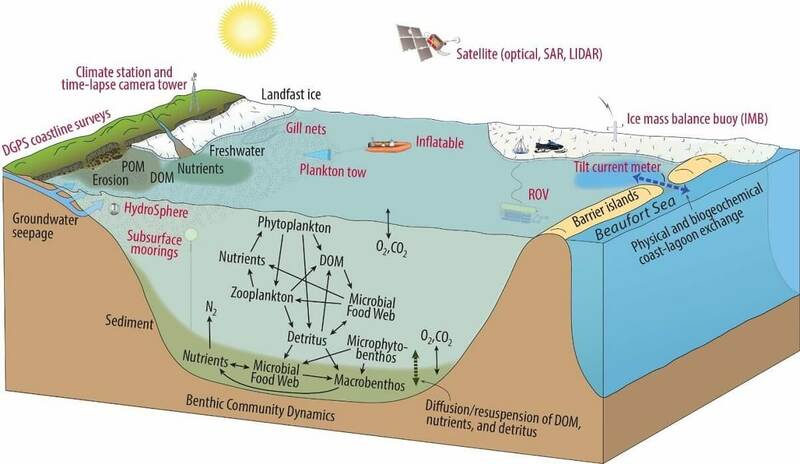 We use lagoons along the Alaskan Beaufort Sea coast as experimental units to examine concepts of seasonality, resilience, stability and trophic redundancy over both spatial and temporal timeframes. Our work focuses on three research nodes: Elson Lagoon (western Beaufort), Simpson Lagoon and Stefansson Sound (central Beaufort), and Kaktovik and Jago lagoons (eastern Beaufort). At each node we conduct seasonal field studies during ice covered, ice break-up, and open water periods throughout the year. During the summer we conduct a variety of research that ranges from collecting lagoon sediment for measuring nutrient concentrations to filtering seawater for examining phytoplankton abundance. We analyze many organisms for the role they play in the food web from the microscopic bacterial community to larger animals like polychaetes (marine worms), amphipods (small crustaceans), and fish. Meteorology stations established at each node measure temperature and wind speed while stationary cameras capture the dynamic sea ice in the lagoons over the Arctic winter. Our oceanographers deploy instruments that spend the winter under the ice to measure temperature, pH, and salinity. Schematic of major lagoon system components (labeled black) and tools (labeled red) that will support Beaufort Lagoon Ecosystems LTER research. As research progresses, we will share key findings and datasets on this site.